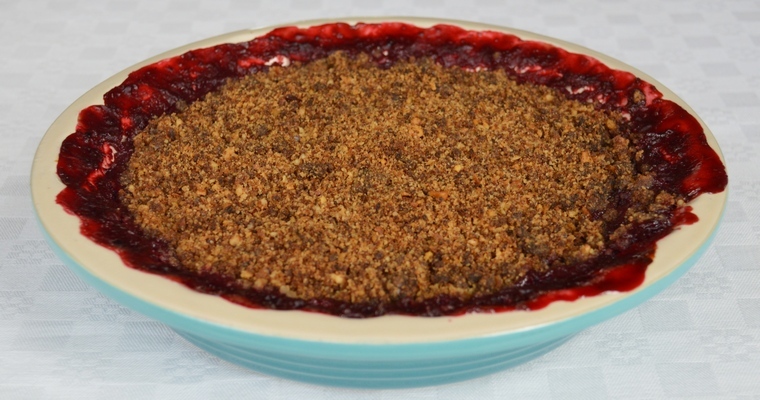 Custard is a sweet dessert sauce that is traditionally served with hot desserts like steamed puddings, fruit pies and fruit crumbles. It is made by whisking hot milk into eggs yolks and sugar. This thin and runny liquid is then heated gently until it is transformed into a thick and viscous sauce that has an almost gel-like consistency. When ready, the sauce should cling to the back of the stirring spoon when it is lifted free. This ensures that the custard will cling to the food, rather than running off and pooling at the bottom of the bowl. 02. What makes custard thick? When eggs are heated, the proteins coagulate to form a solid mass that acts as a gelling agent. You can see this principle in action when you crack an egg into a hot frying pan, or scramble eggs in a saucepan. Reduction sauces like gravy are effectively thickened by time, as the excess water is driven out by brisk heating. However, if you heat egg-thickened sauces too aggressively, the eggs overcook and curdle into a lumpy mess. Egg-thickened sauces start to thicken at a temperature of 70°C/158°F, and should not be taken above 80°C/176°F. This means that thickness is determined by the number of egg yolks, as the sauce cannot be boiled down to reduce the cooking liquid. 03. Why do some custard recipes include cornflour? Many custard recipes include a powdered starch such as cornflour or arrowroot, which is whisked into the egg yolks and sugar to form a paste. Starch-thickened custards can be cooked at a higher temperature, as the starch helps to stabilise the eggs. About 1 tablespoon of starch is needed to thicken 300 ml of custard. Technically speaking, starch-thickened sauces are not true custard, and are instead called pastry cream (or crème pâtissière). Although they remove the anxiety from making custard, they can result in an overly-thick consistency. 04. How do I prevent lumpy custard? 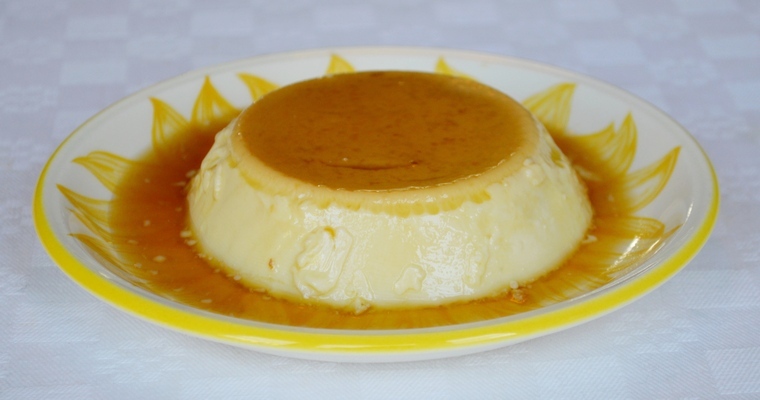 Custard goes lumpy when it is overcooked, creating a sauce that resembles an unappetising suspension of scrambled egg. 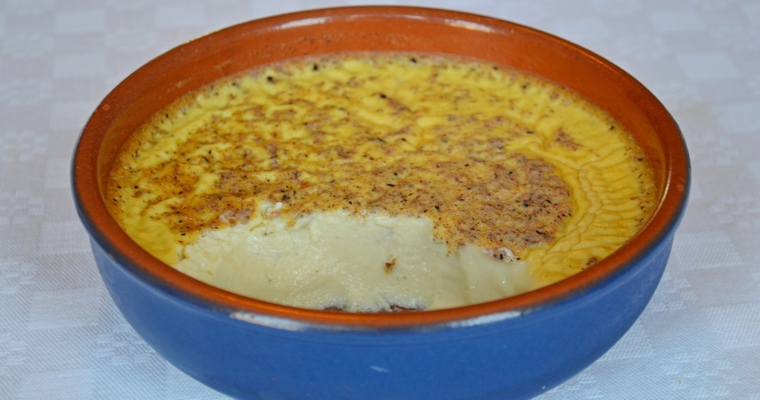 To prevent scrambling, egg-thickened custard needs to be cooked slowly over a gentle heat. It requires constant stirring, which stops the areas that are in direct contact with heat – at the bottom and sides of the pan – from overcooking. I like to use a whisk to do this, but any implement that can agitate and get into the edges of the pan is fine. You can salvage lumpy custard by blitzing it in a blender for 30 seconds, and then pushing it through a fine sieve. 05. Can you make dairy-free custard using nut milks? Nut ‘milks’ are an emulsion of ground nuts and water. They are made by grinding nuts to a paste and mixing vigorously with water until fully blended. The mixture is then strained through a fine mesh material. This tends to produce a fairly thin liquid, that is less viscous than cow’s milk. For this reason, commercial nut milks usually add a powdered starch like tapioca to act as a thickening agent. Just like egg-thickened sauces, nut milks do not respond well to high temperatures. If you heat nut milks all the way to boiling point, the heat-sensitive emulsion breaks down. This causes the finely ground nut particles to separate out from the water, resulting in a grainy texture. As egg-thickened custard should not be cooked to a high temperature, this makes nut milk a perfectly acceptable substitute for cow’s milk. Coconut milk has a high fat content, which means that it produces a thick, rich custard. However, it imparts a distinctive flavour that is not always appropriate. I’ve used full-fat coconut milk to make a Middle Eastern-inspired milk pudding flavoured with cardamom and rosewater, but would not recommend coconut-flavoured custard poured over apple pie. Nut milks made with walnuts and brazil nuts have a slightly bitter flavour, while pecans and hazelnuts produce a sweet-tasting milk that is nevertheless fairly distinctive. Almonds, cashews and macadamias produce the mildest-tasting nut milks, wwith bright and slightly buttery flavours. Homemade almond milk makes a totally dreamy, creamy custard, which is very versatile. When I make almond milk custard for friends, they either do not realise it’s dairy-free, or comment on the lovely flavour. 07. Why do you recommend using homemade nut milk? Although you can absolutely use shop-bought nut milk to make custard, homemade is preferable. The superior flavour and creamier mouthfeel makes it a more direct replacement for cow’s milk. Homemade nut milk is free from gut-irritating preservatives, emulsifiers, and thickeners – all of which may effect how the milk behaves when heated. You can control the thickness of homemade nut milk by increasing the ratio of ground nuts to water (from 1:4 to 1:3), and by gently heating the milk in a saucepan until it thickens to a cream-like consistency (as per the first step of this recipe). You can find more information and tips on making your own nut milk in my article How to Make the creamiest Nut Milk, which also includes a link to my Almond Milk Recipe. 08. Can I add extra flavourings to custard? Custard has a delicious and subtle flavour of its own, although it is fairly common to add flavourings to complement the dessert. Vanilla is the most popular choice, but, as any veteran of British school dinners will attest, you can’t beat chocolate custard when you need a bowl of instant comfort. When adding flavourings, it’s important to think about the effect they may have on the texture. Vanilla essence and chocolate both melt seamlessly into the sauce, retaining the uniform texture and appearance that is central to custard’s appeal. But if ground cardamom seeds are added to custard, the sauce takes on a speckled appearance and a slightly gritty texture. This means that it is better to use spices in whole form, and fish them out before serving. Whole spices take longer to release flavour, and the flavour that they do produce is subtler. Whole green cardamom pods create an aromatic hint of cardamom, rather than a concentrated flavour that dominates. For a stronger flavour, the milk may be left to cool and infuse for at least 10 minutes, and then heated a second time. Other whole aromatics that can be used to infuse flavour into custard include cinnamon sticks, shredded lemon or orange zest, and herbs such as mint leaves or thyme sprigs. You can also flavour custard with alcohol, stirring through 1/2 – 1 tablespoon of brandy or rum at the end. 09. How can I use up the leftover egg whites? Pour the milk into a saucepan. Slit the vanilla pod in half length ways. Scrape out the seeds with the tip of the knife and add to the milk, along with the pod. Heat slowly over a gentle heat to just below boiling point, until you see small bubbles barely breaking the surface. Expect this to take at least 10 minutes, and stir frequently with a whisk or wooden spoon. if using commercial nut milk: turn off the heat. if using homemade nut milk: reduce the heat. Simmer gently for 10 minutes, then turn off the heat. By this point, the milk should be noticeably thicker, with a viscosity that is closer to cream. Fish out and discard the vanilla pod. Whisk the eggs yolks and honey until fully blended. Gradually pour the hot milk over the eggs in a thin stream, whisking constantly to prevent the hot milk from curdling the eggs. Keep whisking until fully blended. Pour the custard mix back into the pan. Heat slowly over a gentle heat, stirring constantly, until the custard thickens – about 10-15 minutes. Test for doneness by lifting the stirring spoon free from the sauce – it should cling to the back of the spoon, rather than running off. Once cooked, take off the heat but carry on stirring for another minute, as the eggs will continue to cook from the residual heat. Pour into a jug and serve immediately, or keep hot until needed by standing the jug in a pan of hot water and covering snugly with tin foil. Pressing plastic film over the surface will prevent a skin from forming. To save for later, pour into a container, cover the surface with plastic wrap, and transfer to the refrigerator once cool. Custard can be kept for up to 3 days before it starts to break down. Reheat using a bain marie (place the custard in a heatproof bowl, and set over a pan of simmering water. To prevent curdling, make sure the base is not touching the water by using a bowl that has a wider diameter than the pan, or sitting the bowl on top of a steaming basket). This recipe unfortunately does not work. I’ve made custard many times with regular milk but recently went dairy free so I tried this. The eggs separate every time and it never thickens, just curdles. Corn starch is definitely needed! Hi Kailynne, thanks for the feedback. I’m sorry to hear you’re having problems making dairy-free custard. Let’s get to the bottom of this! Firstly, what dairy-free milk are you using? Some of them contain preservative, emulsifiers and thickeners which may effect how the milk behaves when heated (see my article http://www.paleopantry.org/article-how-to-make-the-creamiest-nut-milk/ for further details). Secondly, are you using room-temperature ingredients, as you should not cook eggs straight from the refridgerator. Curdling happens when you heat the eggs too aggressively, causing the proteins to coagulate and set (like scrambled egg). So it sounds to me like you might be heating the custard too quickly, over too high a heat. You have to be super attentive to custard, keep on stirring, and have faith that it WILL thicken over a gentle heat. It may be that it takes longer than 10 minutes, depending on variables such as the size of the eggs, the pan, or the heat source. As you say, if all else fails, and you don’t have time to wait for the custard to naturally thicken, you can make a starch paste and add that in. And if it does curdle, you can always push it through a sieve to squash out the lumps. I like to use arrowroot powder as my go-to thickener. Arrowroot powder should be added right at the end of cooking, and cannot be added straight into a hot liquid. 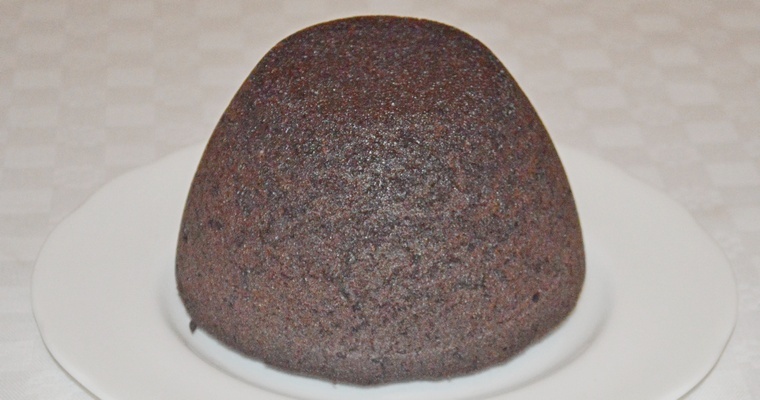 It must first be whisked into a cold liquid to form a paste – typically 1 part arrowroot powder to 2 parts cold water. Around 1 tablespoon of arrowroot powder (mixed with 2 tablespoons of cold water) is needed to thicken 1 cup / 240 ml of liquid. 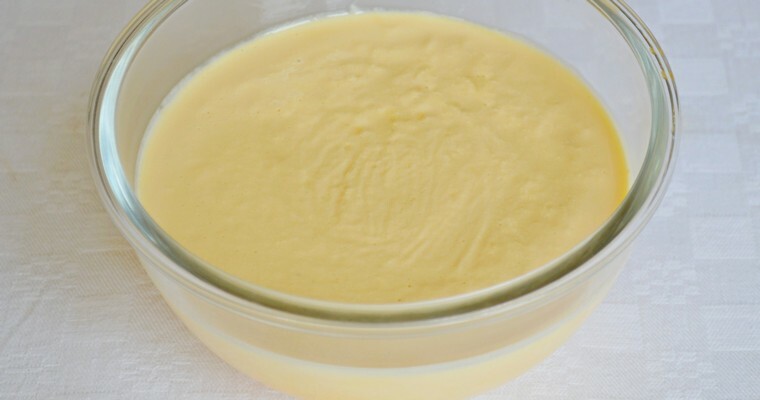 Once added to hot liquid, keep stirring over a moderate heat until the custard suddenly thickens – about 1 minute – and then turn off the heat immediately (arrowroot breaks down and looses its thickening properties if it is cooked for too long). Alternatively, baked egg custard is much easier to make (http://www.paleopantry.org/dairy-free-baked-egg-custard-made-with-almond-milk/). It is cooked in a water bath, which prevents curdling. I used soy milk, eyeballed the ingredient amounts, and just made sure to stir continuously. I was surprised honey worked as a sweetener. Thanks for letting me know how you got on using soy milk – glad to hear it was successful! I love using honey as a sweetener, because it adds a subtle floral flavour. Chemically, honey is great for making custard with because it has an acidic pH (sugar has a neutral pH). This means that it encourages egg proteins to coagulate, which accelerates the thickening process. 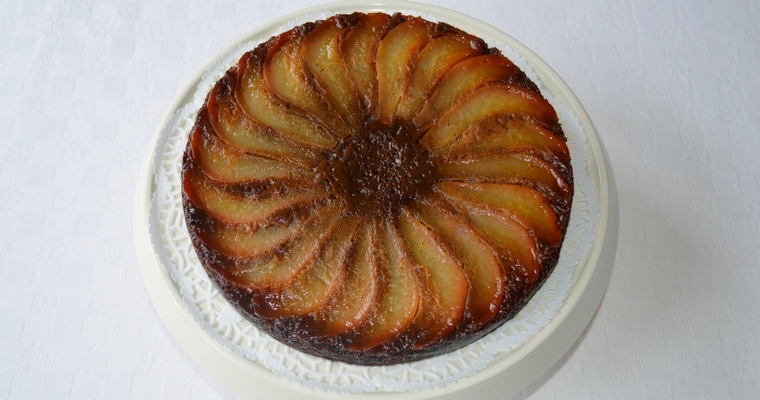 If you’re interesting in experimenting further with honey, I’ve written an article on it here: http://www.paleopantry.org/article-replacing-sugar-with-honey-in-baking-recipes/. If I don’t care about using cornstarch how much should I add, approximately? 2-3 teaspoons of cornstarch (aka cornflour) should be whisked into the egg yolks and honey – depending on how thick you like it.